Powers/Abilities: Geiger takes on the powers and personality of any other gamma irradiated being she is within the proximity of. If she is around two of them she will take on the characteristics of the one with stronger gamma readings and/or personality. This is also her weakness, as it takes a lot of will power to control this ability. She can also look into another gamma being's head and know everything about that being. 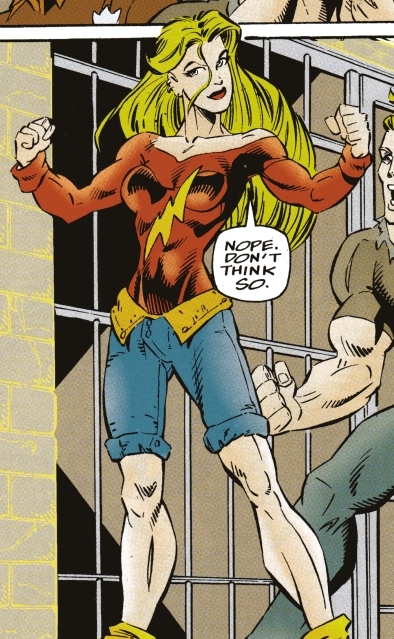 History: (Doc Samson#3 (fb) - BTS) - Dee Dee was a student majoring in physics (and apparently a bit of a partier) at Empire State University when she monitored an accidental surge in the university's new experimental particle accelerator. (Doc Samson#3 (fb) - BTS) - Dee Dee started having dreams where she was the serial Patchwork killer. (Doc Samson#1) - Dee Dee had another dream of the serial killer Patchwork attacking another woman. Patchwork was within the proximity to Dee Dee while attacking a woman, and Dee Dee took on Patchwork's appearance and personality. Doc Samson arrived at the scene and thought Dee Dee was the real Patchwork. The two began to fight, and Samson accidentally tackled Dee Dee into the river. (Doc Samson#2) - The two of them fought back and forth. Samson went up for a breath of air, but Dee Dee pulled him under again. Eventually Dee Dee loosened her grip and started to look like she was changing (unbeknownst to them, it was because Patchwork was absorbing She-Hulk). As Dee Dee fought the transformation, Samson took advantage of the distraction and knocked her out and then pulled her out of the river. But Samson immediately knew that it wasn't the killer since the killer was proven to be a man, and he could tell that this was a female creature. The authorities took Dee Dee to a cell, where Samson used a special type of Geiger counter of his own to determine that rather than having her own, unique, gamma signature, the prisoner was now steadily matching his own. Realizing she still was partially tapped into Patchwork's form, Samson questioned her about Patchwork, learning who he was targeting next and that he was afraid to get caught. As Dee Dee fought to escape Patchwork's form and influence, Samson aided her, instructing her to focus on taking his form and pattern instead. Dee Dee initially thought she had truly been the Patchwork killer, but Samson and Det. Trina Sharp explained the truth to her; Sharp dubbed Dee Dee "Geiger" due to her ability to latch onto nearby gamma patterns. A mob of people then tried to get in and kill Dee Dee, since they also thought she was the Patchwork killer. While Samson sent them away, Dee Dee briefly felt Patchwork's influence again, realizing that he hadn't gotten what he wanted (when he found out the green eyed girl he'd slain had actually been wearing colored contact lenses). Dee Dee explained to Detective Trina Sharp that Patchwork was going to strike again, after which she donned a costume patterned after Samson's classic one, and she and Det. Sharp convinced Samson that he needed her to help find Patchwork. 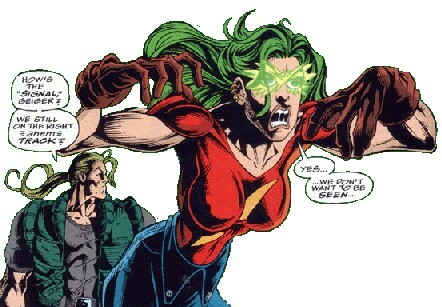 (Doc Samson#3) - Geiger related her origin to Samson while on patrol for Patchwork. Geiger sensed Patchwork grabbing a screaming jogger and pulling her into an alley, and they set off on his trail. They followed him, and Samson reminded her to focus on him so she wouldn't adapt Patchwork's form and mind. Dee Dee found the jogger bound and unconscious, and Samson realized too late it was all a trap just as Patchwork ambushed them. Patchwork slashed Geiger, who started to revert to being like Patchwork. To prevent that, Samson made Geiger fall asleep with a post-hypnotic suggestion (Freudian Slippers). Geiger missed out on the fight, which saw Patchwork triumph over Samson (due to Patchwork feigning severe injury and drawing Samson in to check on him, plus his ability to drain gamma powers). Patchwork slew his next victim and escaped with her. Already defeated once and with his powers halved, Samson decided to give up and head back to California, leaving Geiger to inform Sharp. The Punisher (Frank Castle) pressured Samson to stay on the case, and he was convinced after getting a call from Kyle Barker, a boy he'd stopped from committing suicide (who was really Patchwork). (Doc Samson#4) - Carrying Sharp on her back, Geiger trailed Samson, just missing him at the site of their recent defeat by Patchwork and then heading to Jen Walter's hospital room before finally finding him in a newsstand buying some nudie magazine. Samson led Geiger and Sharp to the offices of Playpen magazine where he and Sharp noted that the magazine's last four centerfolds' recorded vital statistics matched those of the composite corpses Patchwork was assembling. Samson said that they could lay a trap for Patchwork by getting someone to pose who had a unique attribute that Patchwork would want. He implied that he thought Geiger should pose due to her green hair. Soon after, Samson realized Patchwork was really Kyle Barker (from Barker repeating something Samson had said to Patchwork), who was employed retouching photos for Playpen. When Samson, Sharp, and Polaris (Lorna Dane) went to confront Kyle, and transformed into Patchwork and smashed through a wall, encountering Geiger again. Geiger scared him off and made him run away by threatening to expose to him what he was on the inside, since she was in his head and knew everything. After Patchwork fled, Samson thanked Geiger, but requested she left the case and returned to her studies for her own sake. When Dee Dee returned to ESU everyone asked her about her experiences with Samson and Patchwork. She figured out Patchwork was a photography major at the same school who was always borrowing their gamma accelerator. With that, she realized he had been mutated in the same accident as her. She also discovered that Patchwork had stolen some pieces of technology that made gamma micro-bursts. Encountering She-Hulk and Sharp when they and Samson had also approached the particle accelerator after learning Barker's previous involvement with it, Dee Dee informed them that Patchwork planned to activate the accelerator to kill himself. Samson arrived too late to stop to stop Patchwork from activating the accelerator, but he risked his own life pulling Patchwork about before the radiation slew him. Using that information, Samson was able to stop find and ultimately stop Patchwork. Afterward, Samson gave Geiger a lock of his hair, just in case she ever needed to focus on his energy signature to prevent becoming a monster again. (Civil War: Battle Damage Report) - Tony Stark considered Geiger as a potential Initiative recruit. (Avengers: The Initiative#8 (fb)) - Geiger was drafted into the Initiative, and arrived in a bus full of new recruits including Ant-Man, the Crusader, Melee, Geldoff, Dragon Lord, Red Nine and Diamondback. Taskmaster inspected the recruits as they arrived, introducing himself as their drill instructor. Geiger and the other recruits scattered when Ant-Man wound up in a fight with fellow recruit Stature. (Avengers: The Initiative#9 (fb)) - Geiger and the other new cadets were pitted against Taskmaster and quickly beaten by him in battle. Later, Taskmaster brought them to the combat simulator room to test their abilities against robots, but the rampaging clone KIA burst in. Geiger joined the other cadets in attacking KIA. (Avengers: The Initiative#9) - Taskmaster found Geiger's unconscious body after her defeat at KIA's hands. (Avengers: The Initiative#10) - Ant-Man crawled out from under Geiger's unconscious body and selfishly chose to sit the fight out with Taskmaster rather than face KIA again. (Avengers: The Initiative#12) - Geiger accompanied Triathlon, Taskmaster and her fellow cadets as Dragon Lord's remains were delivered to his family. (Avengers: The Initiative#14) - Geiger was present at Camp Hammond when 3-D Man appeared to warn the Initiative about the Skrull infiltration in their ranks, but due to a deception by Crusader he was led to believe that everyone at Camp Hammond - including Geiger - was a Skrull. (Avengers: The Initiative#15/Secret Invasion#3/Secret Invasion: Runaways/Young Avengers#1) - Geiger was sent into battle with the rest of the active Initiative cadets to defend New York against an army of powerful "Super-Skrull" agents. (Avengers: The Initiative#20) - Geiger was among the Initiative cadets who were upset with the 3-D Man for killing Crusader, who had been a Skrull. (Avengers: The Initiative#21) - Geiger graduated from Camp Hammond's training program and was assigned to an unidentified Initiative team. (Avengers: The Initiative#23) - Geiger helped with the cleanup in the area around Camp Hammond after the battle with Ragnarok. She was later present when Norman Osborn arrived to close down Camp Hammond forever. (Fear Itself: Youth in Revolt#1) - When the Serpent (Cul) began his reign of terror on Earth, Steve Rogers commissioned Prodigy to reassemble the Initiative to handle the fear-induced rioting that was spreading across the country. Geiger was among the Initiative members who gathered in Washington DC to rejoin. (Fear Itself: Youth in Revolt#2) - Geiger joined Frog-Man, Firestar, Scarlet Spider and Gravity to deal with fires in New Jersey. Inside a building they ran into Crossbones, who tossed Geiger aside with ease. When Crossbones threw a grenade at Gravity Geiger blocked the explosion with her body. Barely surviving she was taken away in an ambulance. Crossbones escaped. Thanks to Leader's Lair, for saving me the time I would have taken scanning these pictures myself. Geiger is among the Gamma Mutates in World War Hulk: The Gamma Files.